Deprivation does strange things to people. Case in point: all the Pinoys here on camp who, plied with DIFAC (dining facility) food day in and day out, crave collectively for uga or dried fish. Yes, dilis and danggit, those humble little bits of dried fish that stink when fried, but are salty-crunchy good. 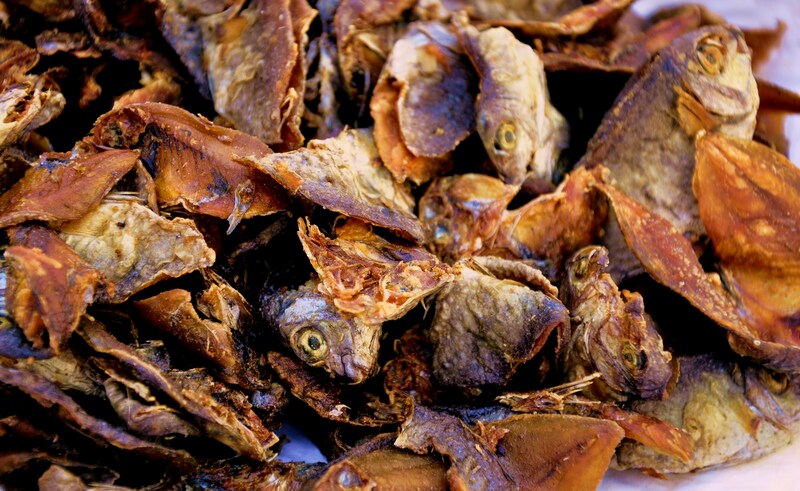 Dried fish hits the spot for us Pinoys after months of greasy, under-seasoned American-style food. I don’t eat dried fish that often at home, but when I do, I usually have dilis, those small anchovies. I stir-fry them briefly with a little brown sugar and chilli powder, then serve the dilis as a side dish to compliment beef nilaga (beef in a clear soup). Yum. But here in Kabul, where the taste buds are much deprived, uga saves the day. Chow hall food tends to lean aggressively towards the bland. Most days it’s either a medley of meat drowned in unrecognizable sauces or fried everything. Fried potatoes with breaded fried fish, fried pork, fried chicken. For variety there’s extra dry turkey breasts with equally wilted broccoli and carrots. The salad bar has all the same stuff I remember seeing there from two years ago. The exact same kind of lettuce, cut exactly the same way. All the same ingredients laid out in exactly the same spot, the handiwork of an obsessive-compulsive chef, probably. On some days the food offerings are just depressing, so what do we Pinoys do? We turn to uga. One of the guys goes out to that hidden spot behind the water treatment plant to fry up the smuggled dried stuff, fresh from the checked-in luggage of whoever recently came back from break in the PI. We pilfer those little pats of butter from the chow hall and use that to fry the dried fish in. Butter-fried uga, the humble ingredient elevated to lofty invented cuisine. Depending on the variety of our stash, we also usually have dried squid, and sometimes salted red egg to go with it all. You could say we overkill it a little with the salt. But we gobble up the salty, stinky stuff like it’s foe gras. Deprivation, it does strange things to you. This entry was posted in The Stories and tagged camp life, eats, Kabul, life skills, living abroad. 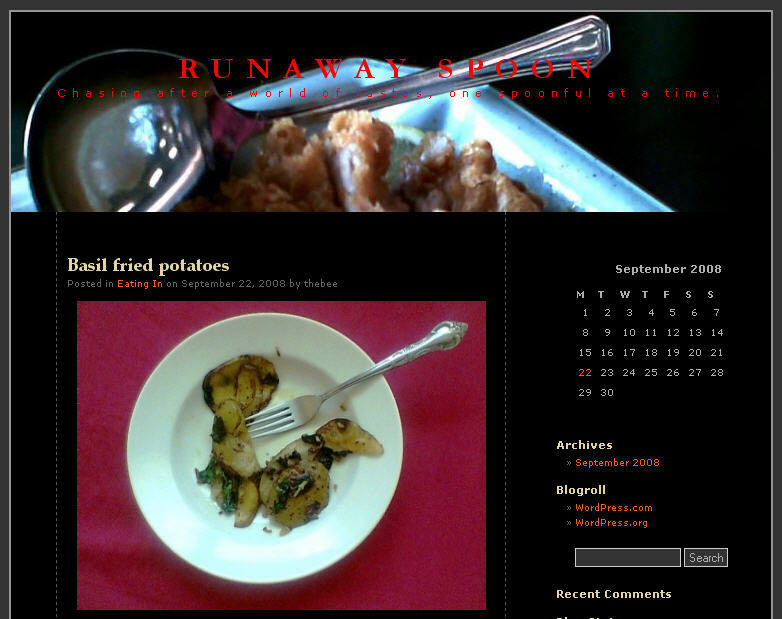 I don’t know how I’ll manage it, or where to get the time, but the long-planned food blog is up and running. Among other things, I am also a closet cook. Weekends not spent lounging around the house or imbibing with friends become cook-in weekends. Sometimes the dishes I make get gobbled up so fast, photos are forgotten, and empty plates look up at me, shining with recrimination. The photos I did manage to take have all been languishing in the hard drive. I’m shaking them out and recreating recipes that I usually make from scratch. Some people have a memory for images, I think I have a memory for tastes. So, drawing from this store, I hope to let loose my cooking (and eating) on the Web. Drop by and ogle some munchies. Bon appetit! This entry was posted in The Bee, The Honey and tagged eats, food, food blogs.